Print: Distressed Look, Black & White on top with Belt & Blue Jeans Graphics from the waist down. Size: 6 Months. Special Features: The sun glasses, belt, pockets, and patches are only part of the graphics. Brand new with tags Matvel Comics Amazing Spider-Man boys romper with beanie hat by Disney Baby from Disney Store. Age 6-9m. 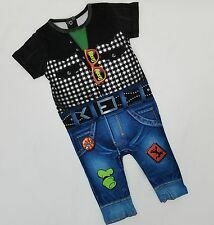 100% cotton - perfect for your little Super Hero Disney style & quality. Check my feedback and buy with CONFIDENCE! I ship QUICKLY and SECURELY for FREE! Disney Cars Button Down Romper. 5 Snap Bottom. Machine Wash. Elastic all around waist. 100% Cotton; 60% Cotton, 40% Polyester. Mickey Mouse Boy's Two Piece Short Outfit. Size ~ 3 Toddler. Elastic waist shorts with Velcro close pocket for treasures. Pullover short sleeve shirt. Style: Short Sleeve Mickey Mouse Short Set. Size: 6/9 Months. Care: Machine Washable. I don't have a set. Color: Blue, Red, White, Gray, Black & Beige. If any problems. Chip, Dale, Santa Mickey, and Minnie Mouse "Naughty or Nice?". Long Sleeve Bodysuit for Baby. Sleeves feature allover screen art pattern of Santa Mickey, Minnie Mouse, Chip, Dale, Christmas trees, and dots. Elastic all around waist. 60% Cotton, 40% Polyester. Machine Wash. Screen-print with soft hand feel. Style: Sleeveless Mickey Mouse Short Set. Size: 3/6 Months. Care: Machine Washable. I don't have a set. Color: Red, Blue, Gray, Yellow, Beige, Black & White. If any problems. 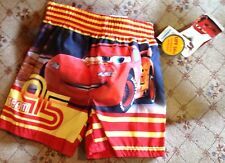 Disney Pixar Cars two piece short set, infant size 18 months. 100% cotton comfort. Solid blue shorts with elastic waist band. 10" across the front of the waistband unstretched. Inseam is approx. Shirt is approx. Style: Baby Boys 2-Piece Cars "Win A Race. And Have Fun!". and prompt about resolving matters if and when they arise. Size: 6/9 Months. Care: Machine Washable. Color: Black, Red, White, Yellow & Orange. 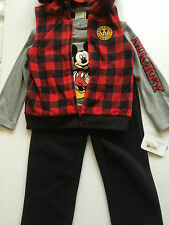 Disney Mickey Mouse Toddler Boy's 3 Piece Shirt & Shorts Set Size 3-6 Months New NWT. Condition is New with tags. Shipped with USPS First Class Package. Size: 12 Months. Machine Washable. Fabric: Top - 60% Cotton 40% Polyester - Bottoms - 62% Cotton 38% Polyester. I don't have a set. Color: Red, Blue, Yellow, Beige & White. If any problems. Ribbed collar with faux fur (looks like a white beard). Mickey is all set to get your jolly little one ready for the season. Faux fur edge on top hem; cuffs and hat. Set includes top, pants and coordinating Santa hat with embroidered details. Style: Baby Boys 2-Piece "MICKEY" Outfit. Size: 3/6 Months. Care: Machine Washable. Color: Blue, Red, Black, White, & Yellow. We will be fair. I don't have a set. If any problems. responded to promptly. SIZE: NEWBORN. THE CUTEST 2-PIECE OUTFIT FOR YOUR BABY BOY. NWT Disney Mickey Mouse baby outfit : gray printed tank with shoulder snaps for easy on and off & matching red French Terry shorts with an elastic waist. Size 6-9 Months. Mickey Mouse. 3 Piece Set, Tank Top, Shirt, Shorts. FOR SALE IS A 2-PIECE BABY BOY'SMICKEY MOUSE OUTFIT.SIZE 12 MONTHS. OUTFIT INCLUDES ONE SHORT-SLEEVED SHIRT WITHMICKEY MOUSE ON THE CHEST WITH THE WORDS "BOYS WILL BE BOYS " AND ONE PAIR OF PLAID SHORTS. New Infant Baby Boys Monsters Inc. Outfit Hoodie Shirt & Sweat Pants NewBorn size. Condition is New with tags. Shipped first class. Size: Newborn. Boy's Outfit. More Great Deals for the Whole Family! Other pajamas listed, plus. Very cute short and shirt set. It is a sleeveless shirt that says "Hangin' With The Crew" on the front with a big picture of Mickey Mouse, Goofy and Donald Duck. Size: 4T. Mickey Mouse Outfit. Sleeveless Shirt and Shorts.